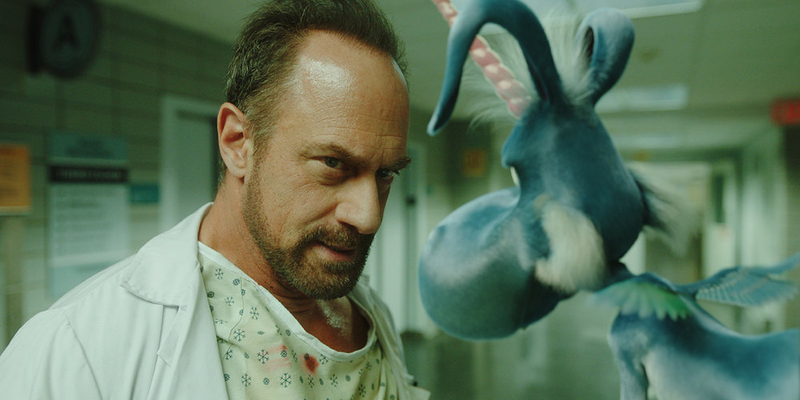 SYFY's adaptation of Grant Morrison's Happy! serves up a demented dark comedy that squeezes the last bit of juice from the tired antihero formula. A few years ago, you couldn’t swing a dead cat and not hit a TV show with a brooding, difficult but “totally awesome” man as its lead.. From Tony Soprano to Don Draper to Walter White, the Golden Age of television was marked by its surplus of difficult men, men who are great at their jobs but terrible when it came to the management of even the most basic of human relationships. Men who played by their own rules and were ultimately rewarded and adored for their antics — mostly by those watching — regardless of whether or not that’s what the creators of such characters had in mind. Though it’s less prevalent and more heavily criticized, TV is still chock full of antiheroes and difficult men. Shows like SYFY’s Happy!, which makes an honest attempt to do the formula one better by taking it to such an obvious extreme that any sort of hero worship would seem totally out of the question. But there’s a hiccup: series star Christopher Meloni is so watchable in the role that a little misplaced adulation simply can’t be avoided. Based on the graphic novel of the same name by Grant Morrison and Darick Robertson, Happy! hails from Brian Taylor (of Neveldine/Taylor fame), who is joined by Morrison in the scriptwriting department along with Patrick Macmanus, to bring this seven-episode adaptation to life. The result is a deeply demented dark comedy that serves up one frenetic action-comedy set piece after another, in the style patented by Taylor and his usual directing partner Mark Neveldine in films like Crank, Gamer, and Ghost Rider: Sprit of Vengeance. Taylor’s visual style is well suited to the material, delivering stylized, exaggerated violence with a wry smile and cartoon sheen to accentuate Morrison’s already over-the-top narrative. Like a Shane Black movie gone haywire, Happy! unfolds over the holidays, coating Christmastime with a patina of grime, as Meloni’s disgraced super cop-turned-hit-man Nick Sax contends with a failing heart, a hit gone wrong, a mob boss out to kill him for a password he may or may not know, and the manifestation of a absurdly cheery purple cartoon unicorn name Happy and voiced by Patton Oswalt. Happy is the imaginary friend of a little girl name Haley, along with several other children, was kidnapped by a demented killer with a Santa fetish. Happy, for reasons that remain mercifully unexplained, materialized and sought out the absolute worst person imaginable to save a little girl in need. Even a cursory look at the plot tells you this is perfect material for someone like Taylor, whose past efforts suggest the jankier the better when it comes the circumstances of the story he’s engaged with. Taylor isn’t particularly interested in elevating the material; he’s looking to immerse himself in it, to splash around in the murky gray waters of a lunatic killer communing with and corrupting an imaginary flying horse while on the road to a prescribed redemption. Taylor’s characters often work best starting at rock bottom. That was true of Crank protagonist Chev Chelios, as well as Gamer’s Kable, and, to a certain degree, Ghost Rider’s Johnny Blaze, and it’s certainly true of Nick Sax, who begins the series with a hallucinatory suicide fantasy that sees his head turned into a geyser of blood while he cuts a merry rug with a group of scantily clad dancers. As far as introductions go, it’s the rockiest of bottoms, which means Nick has nowhere to go but up, and yet, somehow Happy! finds new depths to which its character can sink. As Nick puts it, his life is an “ever-swirling toilet that just won’t flush,” a description that, admittedly, might limit the audience size for Happy! That seems perfectly fine for this hyper-adrenalized series, and it suits Meloni well, as he brings an unblinking and hilarious manic intensity to role. Imagine if John McClane and Gene from Wet Hot American Summer had a baby and you’d end up with a pretty close approximation of the kind of character Nick Sax is. At one point Happy sums up Nick by telling him, “You’re smiling like someone who doesn’t know what smiles are for.” The performance is a demanding one and Meloni is fully committed to going 100 miles per hour whether he’s killing a room full of goons wearing nothing but a hospital gown or eating a hamburger while talking the finer points of being a dirtbag with a tiny flying blue horse. Meloni brings a brutal physicality to the role that turns up the volume on the tough-guy dialogue that’s so often played for laughs, which gives it just enough breathing room so as to not feel oppressively savage. Meloni is so much fun to watch you almost forget the show’s main draw is talking CGI horse. Oswalt (who replaced former SNL regular Bobby Moynihan) imbues Happy with a charming naïveté befitting a child’s imaginary friend. The characterization strikes an expectedly unsubtle chord as the dynamic between the childlike manifestation and Nick’s degeneracy opens the door for some raw laughs. Like most everything else, in Happy!, jokes come at you like they were shot out of a cannon, but it works because everything is taken to such an exaggerated extreme, there’s little time to process amplified element before you’re bombarded with the next. It goes without saying, Happy! is best enjoyed by strapping in and just going along with one hell of an unhinged ride. Because there can’t be too many plot lines running simultaneously, Nick’s adventures with Happy run parallel to the presumed redemption of another dirty cop played by Lili Mirojnick, and the ambitions of a mob boss named Blue, played by the always-great Ritchie Coster who is in full Joe Pantoliano mode at one point, eating a grape and formulating an amusingly circuitous metaphor around its potential to be turned into a fine wine. Blue desperately wants a password shared to the crime family’s recently assassinated heir apparent by the late Don on his own death bed. Meanwhile, Patrick Fischler brings one more deranged psychopath to an already crowded party as the uncomfortably ever-smiling Smoothie, who barely survives his bloody first encounter with Nick. It seems like one distraction too many, but, for a show whose conceit revolves around a psychotic conversing with a flying cartoon horse only he can see, the more distractions the merrier, as they take the burden off the technical complications associated with an all CGI character, while also reducing the amount to which Nick and Happy have to shoulder the weight of an admittedly thin story. Happy! won’t be for everyone. SYFY isn’t shying away from coarse language — there are enough F-bombs dropped in the first two hours to make Tony Soprano exclaim “Marone” — and the violence is brutal and over the top. But Meloni is so much fun to watch and Oswalt is so genuine that the inherent cartooniness of the series is actually enhanced by a pair of mismatched cartoons. That said, the show might be too in love with its rascally antihero, which makes it difficult at times for Happy! to reconcile its character with the downward trend of Difficult Men in television. There’s opportunity here for the series to do something new with the characterization, and hopefully it does, because Meloni’s performance is funny enough to earn absolution of its own. Happy! premieres Wednesday, December 6 @10pm on SYFY.